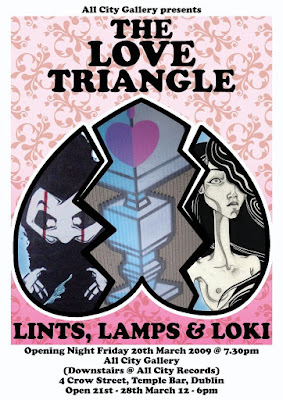 Lampsy - the genius behind the I love lamp stickers around Dublin - was in touch to let me know about the new exhibition featuring themself, LadYLoKibeE and Lints in the All City Gallery - downstairs at All City Records on Crow Street in Temple Bar, Dublin - opening tonight. Go to Dublin's Temple Bar Area. Over the Square, past Urban Outfitters, round the corner is Crow St. Walk up to Foggy Dew / Dame St end. Alternatively turn off Dame St and walk down - we're on the right hand side. Hey Darragh thanks for coming down to the show. Great turnout and a lot of appreciation for all of our work.